MarcL: A flexible PLM solution should allow for individual instances of the same part in different levels of the product structure. It should also be able to present multiple levels of the product structure at the same time on the same window or screen. How is this accomplished in Aras? Peter Schroer: Aras Innovator supports Configuration Management (CM). Good CM practices support the same part appearing in different levels of the product structure. By default, the Aras Innovator framework will enforce that this part does not appear within its own hierarchy because this creates a loop in a configuration and results in indeterminate configurations. This rule can be over-ridden if the customer is not following CMII best practices. 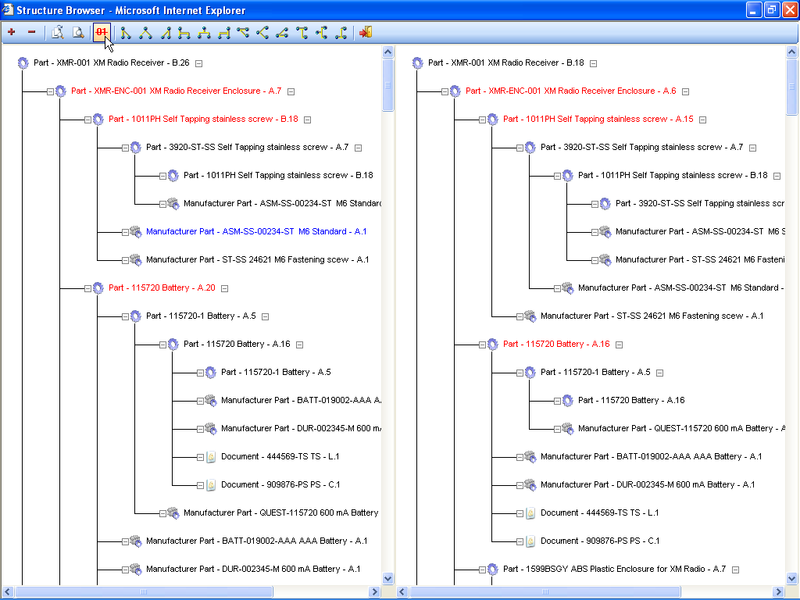 The full hierarchy of the product structure, with variable levels exposed, can be displayed in a single window to facilitate end-user navigation. As a useful comparison tool, 2 versions of the same product structure, or 2 different product structures can be compared side-by-side, multi-level, in the same window. This dialog also supports automated redlining to highlight differences in complex product structures that might be difficult to see quickly as displayed in the screenshot below.